In this sequel to Post-Human, humanity will be forced to face a future more advanced than it could have imagined if it wants to survive. Nineteen months have passed since the A.I. turned against humanity and was subsequently destroyed. In the meantime, James Keats has turned over the A.I.’s powers to a non-intelligent, easily controlled operating system. He and Thel have left the planet and spent six months vacationing on Venus, which has been newly terraformed without the consent or knowledge of the Governing Council. The A.I. has been deleted, but the message it sent out into the abyss of space in search of a companion has been answered. 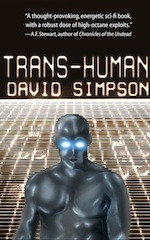 An alien force dwarfing the Earth is on its way to find out why the A.I. has stopped communicating. Keats and company can only assume its intentions will be hostile when it finds out the truth. Only one thing is for sure: nothing will ever be the same again. Welcome to the Trans-Human era.